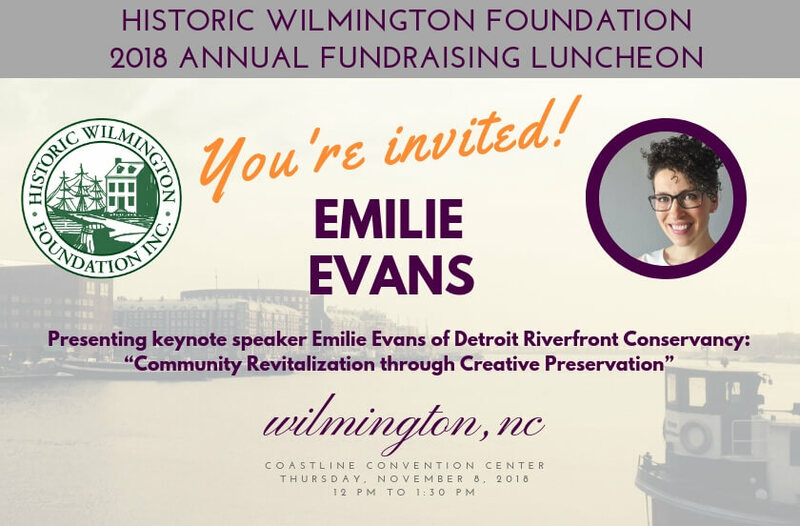 The Historic Wilmington Foundation Annual Luncheon will be held in November 2019. Watch this page for details. Please RSVP to HWF@HistoricWilmington.org or 910-762-2511 by November 1st. Vegetarian plates available; please request in your RSVP. Corporate tables available for purchase. Join us in exploring the power of old buildings to renew neighborhoods. Historic preservation expert and keynote speaker Emilie Evans, Riverfront Development Manager at Detroit Riverfront Conservancy, works to get vacant and underutilized structures back to their full potential. She is co-founder of the award-winning Brick + Beam Detroit, and former director of the Rightsizing Initiative with PlaceEconomics in NYC. $100 suggested individual donation at the luncheon.